“Are we to continue in sin that grace may abound?” (Rom. 6:1). Our answer to this question will inform the course of our Christian lives. Ligonier Ministries is providing resources around the world that give the biblical answer to this question. 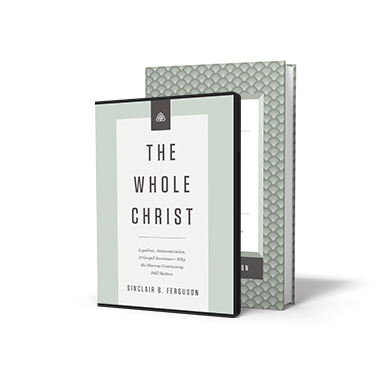 When you give a gift of any amount this month, we will send you a copy of Dr. Sinclair Ferguson’s DVD teaching series The Whole Christ, which addresses this topic in an accessible and pastoral way. Some have said, “Yes, grace means I can sin all I want, that God’s law does not obligate me in any way.” This position is called antinomianism (meaning “against the law”). Others answer Paul’s question by saying, “No, grace means that I should not sin, so I will follow extrabiblical rules to make sure I sin less.” This position is called legalism. Both positions are wrong. Legalism and antinomianism seem very different, but at root they both misunderstand the place of God’s law and the relationship between grace, obedience, and gratitude. Both tendencies keep us from thriving in our walk with Christ. As a pastor and seminary professor, I’ve seen how essential it is to correctly understand the relationship between law and grace. We are hardwired to try to justify ourselves and are thus apt to adopt a “performance-based” view of the Christian life that leads to spiritual pride. To correct this, we are also prone to do the opposite—to forget about God’s laws and permit sin in our lives, knowing that we are forgiven. Too many Christians think a little bit of antinomianism will cure legalism. But that’s a recipe for spiritual disaster. Ligonier exists to help Christians understand the relationships between grace and holiness, between gospel and law. Getting these relationships right is essential. The key to subduing the downward drag of sin in our lives is to know the impulse of gratitude that follows God’s forgiveness. The gospel frees us for obedience, to please God in thanksgiving for our gracious salvation. I know of no one better to explain these issues than my friend and colleague Dr. Sinclair Ferguson. His book and teaching series The Whole Christ are must-have resources on these subjects. When you give a gift of any amount to Ligonier this month, you will receive the complete DVD series, and if you give $75 or more, you will also receive the hardcover book that accompanies the series. Thank you for standing with Ligonier to assist growing Christians to thrive in their spiritual walk.